Press outlets debate merits of TrackingPoint Thought Space Leadership Project. TrackingPoint's™ announcement of a prototype firearm that more than triples the range of their existing Smart Rifle™ systems caused an immediate flood of major reporting. TrackingPoint is currently in the development phase of a prototype. Their current 850-1200 yard smart rifles, commonly consider the best long range rifle systems ever created, are currently shipping to customers who go through the company's application process. “When the digital camera came along, there were a lot of traditional camera users who decried the end of an era and said this is cheating and now everyone will be able to take good pictures, but as you see in the last 10 to 15 years, there is a camera in almost everything that one uses. In 5 to 10 years, we feel that our smart rifles will be more the norm that the exception,” said CEO Jason Schauble. TrackingPoint’s expectation is that the super gun will be able to accurately shoot farther than both the longest confirmed and unconfirmed kills at 2,707 and 3,079 yards, respectively. Craig Harrison, a British sniper, set the 2,707 yard Guinness World Record when he killed two Taliban insurgents in Afghanistan in 2009. “What we have tried to do is allow technology to enable what usually takes many years to get good at - the skill sets of long-range marksmanship - and to make the experience a better one,” Jason Schauble, TrackingPoint CEO told the Daily Caller. 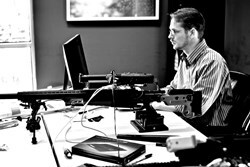 Technology site Ars Technica covered the challenges presented to TrackingPoint's 60+ person Austin, TX engineering team. "Some of the challenges in scaling up TrackingPoint's products have to do with simple physics—the 75W pulsed laser range-finder in today's PGF needs to be scaled up, and although the 35x fixed magnification optic will likely remain the same, the CMOS sensor behind the glass through which the scope sees the world will also likely need to be increased from its current 14.1 megapixel resolution. The software challenges brought about by extending the PGF's effective range, however, overshadow most of the hardware issues. Tripling the range of a PGF is actually close to a six-fold increase in ballistic complexity. Things like the Earth's rotation and the behavior of the fired projectile as it transitions between supersonic and subsonic velocities become significant factors that must be very accurately modeled and accounted for." More information on TrackingPoint's existing Smart Rifle offerings and the technology behind them can be found at tracking-point.com.